Our radio equipped motors use RF (Radio Frequency) for transmission of the remote control signal from a hand-held or wall mounted remote control. These very affordable stand-alone multi-channel systems are extremely easy to install and operate. Our built-in rechargable battery motors require no wires at all! With the RFXCOM™ plug-in for Vera™, you can later extend control of your window blind radio motors to your web enabled devices (PC, phone, tablet, etc). VeraLite at $199 is the bargain of the year when it comes to full blown home automation systems - and very user-friendly. With Vera or Veralite, you can easily monitor and control your home whether you are on the premises or away, and look after the boat down at the dock, that summer cottage at the lake, or that ski chalet in the mountains. You can have the system send email alerts, based on events that you structure yourself with very easy to use wizards. Unlike many PC based systems, you do not need a dedicated 'always on' computer or laptop. 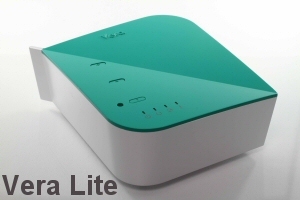 The main difference between Vera and Veralite is that Vera is a complete wifi router, whereas Veralite is an add-on device if you already have a wifi router. You can think of Veralite as a subset of Vera, but they both use the same operating system and they both work the same way. The picture below is representative of evrything you need to set up your Veralite™ (or Vera™) to control our RollerTrol™ motors. In the picture you can see the Veralite™ unit itself, the RFXCOM USB transceiver, and the RollerTrol™ 8 or 14 channel remote control unit. We have labeled the internal battery and Z-Wave buttons, but those functions are not relevant to these instructions and will not be discussed here. These instructions also assume that you have assigned at least one of our RollerTrol™ motors to the remote control. The instructions for assigning motors to the remotes will not be discussed here; the instructions in this article cover the installation of Veralite™ and the linking of our motors to Veralite™ via the RFXCOM™ USB transceiver. The first step is to plug in the Veralite™ home automation web server. 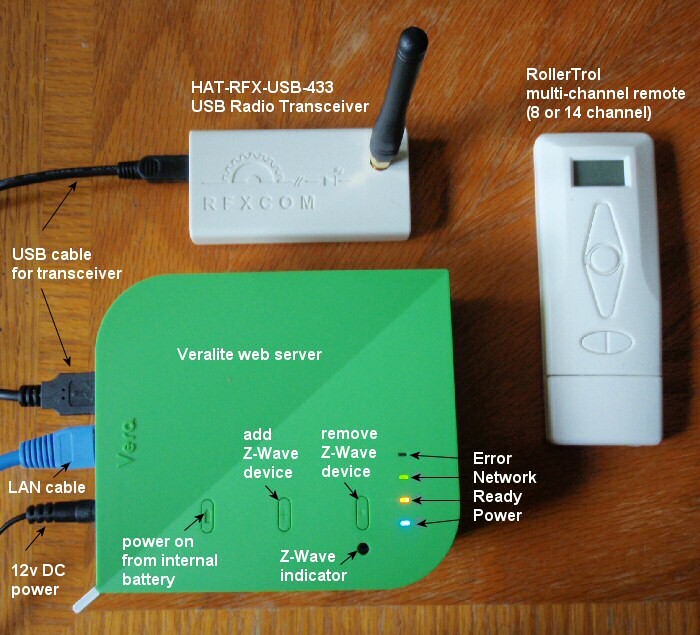 Simply connect a LAN cable to a port on your existing wifi router, connect the RFXCOM USB transceiver to the USB port, and apply power by connecting the provided 12v power supply. Wait for a few minutes until the first 3 lights on the Veralite housing (power, ready, network) are lit. Once these lights are in their active state, the system is ready to use - it's really just that simple. Note that you may have to set up a username and password for the router admin. If you have not done this before, you'll need to check the router docs or contact the manufacturer (or search the net) for the original default login set by the factory. Every router admin panel you see after logging in is different for every brand of router, but you should be able to find a menu item that says something like 'list of attached devices' - this will be where you can find the ip address of your Veralite unit (if you have the Vera unit, it IS the wifi router, so no need to find an additional address). When you click or enter that IP address in your browser and log into the Veralite™ web interface (as per the provided iinstructions), you will be able to follow the easy setup instructions for the RFXCOM™ USB transceiver, which we will cover in part 3. You can bookmark the admin address of both your router and Veralite units. Stay tuned, part 3 coming soon (how to use Veralite & the RFXCOM™ with our motors). We sincerely hope you enjoy using these advanced motor systems; if you have any questions, please feel free to contact us at any time! Copyright © 2010-2011 RollerTrol™ Automation Systems. All Rights Reserved.